Chelsea vs. Manchester City : 12 December 2011. From a long way out, the Monday evening game with unbeaten Manchester City always felt like a big game on a big night. Our uplifting victories over Newcastle United and Valencia, plus the absence of a game for six days, only heightened my sense of anticipation. Two formerly under-achieving clubs, now enjoying a much more prosperous time. Two moneyed clubs heading for a showdown. It felt good. With Manchester City going on such a tear this season, I could not help thinking back to our championship in 2004-2005. There are certain similarities, of that nobody can deny. And I wondered if we could inflict on City the same sort of wound on them that City inflicted on us. Think back to October 2004 and a single Nicolas Anelka goal gave City a 1-0 win at Eastlands. It was to be our only defeat throughout that entire league campaign. During the day, I was upbeat about the match and told a few people that I felt that we would win. I could feel it in my heart. I could feel it in my bones. I could even visualise it in my head. It was a quarter to seven and Rob was tucking in to a fry-up. It was his match-day breakfast. With the game kicking off at 8pm, the three of us from the shires of Somerset and Wiltshire had a full 45 minutes of pre-match reverie. The Goose was packed with loads of familiar faces. Two pints of lager for me. They left me rather light-headed and I knew that I had to stop there. The vibes were good, the pub was boisterous. But then I saw City’s team flashed up on the nearby TV screen and their forward line made me stop in my tracks. We were in for a tough one. However, I was certainly happy with our team and, for once, AVB chose exactly the same team that I would have. Significantly, Romeu was in and Lampard was on the bench. The times they are-a-changing. To be honest, I hadn’t realised the significance of my light blue Hackett cap, adorned with the badge of the Chelsea Supporters Group. It is my favourite cap at the moment – it fits well – and the fact that I was wearing the colours of our opponents had completely slipped my mind. Simon and I headed off down the North End Road, leaving His Lordship to finish swilling the last of his lager. As we walked past the tube, past the CFCUK stall, the wind whistled around our ears, fallen leaves swirling around in circling patterns. Spectators were in a hurry, bustling along to get inside, jackets tight, scarves and caps to the fore. The familiar match day aroma of burgers and onions. The lights of the stadium beckoned us in. The pre-match rituals; The Liquidator, the flags, the entrance of the teams. The rain was lashing down, but we didn’t care. With everybody in place, I realised that Manchester City had only brought half of their potential allocation on this big night in SW6. This really surprised me. I could imagine the United fans, ironically watching from their Old Trafford season ticket seat on their sofa, laughing at this. United always bring three thousand, City hardly ever. Only three City flags. Poor showing, the team of Manchester. I’m not sure why, but as this Monday night game kicked-off, I was reminded of a previous match, as I so often am. Way back in 1994, our second home game of the season was a Wednesday night game against City. I’m pretty sure they wore their famous red and black stripes in that game, too. Maybe that is why I was sent swirling back through the years. We won 3-0 that night, but what I remember most is the attendance. We were on the up, having qualified for our first European campaign in 23 years and had begun the season under Hoddle in good form. With The Bridge undergoing its long awaited rebuilding programme, the capacity was cut to around 23,000. A full house on the opening day against Norwich was followed eleven days later with a game against City. We are used to full houses these days with every game over 40,000. Gone are the days when “Guess the Gate” was such an integral part of the Chelsea match day experience. Back in the old days, we all got rather good at this. In those days, the number of spectators present was an easy indicator of how big Chelsea was, as opposed to how big it thought it was. Back in August 1994, I was hoping that we would get over 20,000 for the City game, but was certainly preparing for a “typical Chelsea” midweek gate of 15,000. Well, I remember being immensely happy with the gate of 21,740 for that midweek game all those years ago. It was a sign that, perhaps, the momentum at our club was changing for the better. Small details from all those years ago – it seems a different age, a different game, in some respects. Crazy, really. How both of the two clubs have enjoyed varying fortunes since 1994. Chelsea – always improving, year on year, but with a few minor setbacks. City – down to the old third division but now back with a vengeance. Well, City were in sublime form during the first twenty-five minutes of the game. I wasn’t paying particularly strong attention on just two minutes – taking a photo, no doubt – when our high line was breached and Balotelli broke and rounded Cech to almost embarrassingly pass the ball into the net. This was only after two minutes and The Bridge fell silent. Out of sight, the Citizens were celebrating, but my eyes were fixed on the nonchalant shrug of Balotelli. A plastic bottle from the MHL flew past him. City purred in the opening exchanges, finding spaces in all parts of our final third. There was a supreme fluidity to their play, with Silva at the heart. Passes were exchanged at will and Chelsea’s best was clearly not good enough. We all feared for the worst. Simon, who runs a local Saturday team, was passing comments about our defensive failings and we were lamenting our play. A Gareth Barry shot whizzed past. A Silva penalty claim was thankfully waved away. Texts from Glenn in Frome and Steve in Philadelphia came through within ten seconds of each other saying that we had been lucky; it was a penalty and only Silva’s theatrics saved us. Slowly, but surely – I can’t say how – we enjoyed more of the ball, more of the territory, more of the game. I guess we stood up as men and Chelsea players. Somehow, we got closer to City, we became less scared. A delightful dribble and shimmy from the lively Daniel Sturridge, way down in front of Parky in the Shed Lower, and a dagger into the heart of the City defence. Meireles arriving, a stab at goal, the ball crashing against the net. What a strike – a truly dramatic moment. We were level and the crowd, already stirring before the goal, were roaring. Not even the United fans at home could join in with that one. At the break, a star from that 1994 game was on the pitch with Neil Barnett; our Russian goalkeeper Dmitri Kharine . As Joe Hart approached the Matthew Harding, he was clapped by a few hundred fans and I realised how this old-fashioned tradition has almost died in modern day football. As Hart is an England international, I guess he is one of the few visiting goalkeepers who will warrant such a response from the Chelsea faithful. If the first-half was eventually shared, the second period belonged to us. A Mata free kick was belted over by Sturridge from an angle, but we were enjoying much more of the ball. Romeu was closing space and tackling hard, his passing clean and intelligent. Mata was the magician, twisting like Gianfranco in his prime. One sublime piece of skill below me drew a foul from Kompany, but the free-kick was wasted. Soon after, a run by Ramires – another player growing as the game progressed- and he drew a foul from Clichy. It was his second yellow and he was off. The home crowd roared. Things were getting better by the minute. It struck me that there were growing similarities to the home game with Manchester United back in March; a goal down, outclassed, an equaliser through dogged perseverance, a sending-off. I mentioned this to both Simon and Alan. The game was brewing nicely. I kept looking at the clock and wanted the game to stir us further in the remaining 25, 20, 15 minutes. On 72 minutes, Frank Lampard replaced the excellent Ramires and I thought back to that night in March when Frank struck a late penalty past Van de Sar. City had already taken off Aguero and Silva; they were settling for a point. This pleased me further. Their attacks were infrequent now and Chelsea were fighting for possession, though efforts on Hart’s goal were rare commodities. Then, in a moment of play which was a blur, the fresh Lampard found Studge, whose shot struck the raised arm of Lescott. The crowd stopped to a man and all eyes centred on the referee Mark Clattenburg. He pointed to the spot and the Stamford Bridge crowd exploded. More thoughts of that game against United. Frank placed the ball on the spot, retreated and the crowd waited. I held my camera steady and clicked just as Frank struck. Straight down Broadway, straight down Regent Street. The ball thundered past Hart and the net flew back as the white ball crashed into it. We exploded again and I watched as Frank dived into the first few rows of the MHL. He was soon joined by his team mates down below me and I clicked away, then celebrated wildly with Alan and Simon, who I inadvertently thumped in the stomach. Wild scenes on a wild night. I was right about comparisons with that United game. I looked around in awe – it really did seem that every one of the 40,000 Chelsea fans were joining in. What a moment. 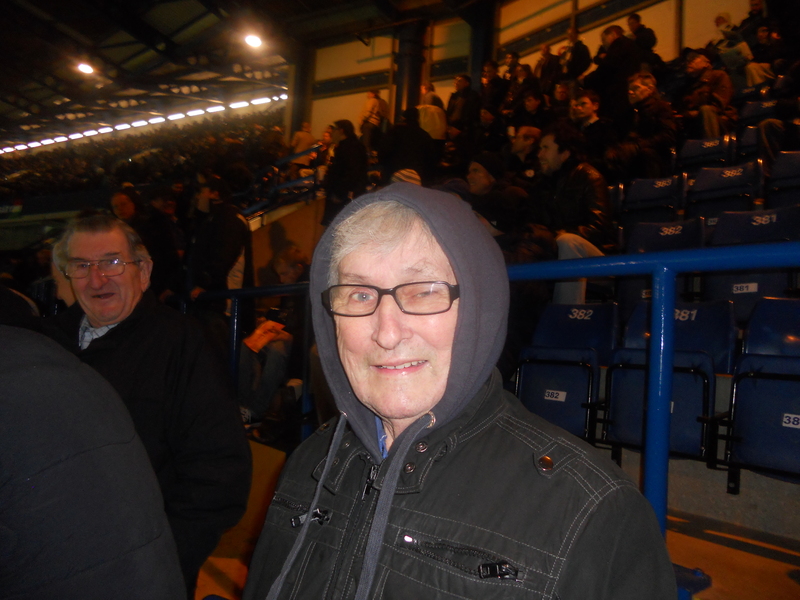 The best noise at Chelsea for years. The rest of the game really was a blur. This is the heavy heavy monster sound. So if you’ve come in off the street. And you’re beginning to feel the heat. You better start to move your feet. …and the Stamford Bridge stands bounced as thousands of Chelsea fans turned nutty. What a night. We got absolutely drenched on the trudge back to the car, and the long drive home was horrible; full of rain, spray, gusts of wind, surface water. But I didn’t care. This had been a superb night, long to be remembered in the history of our beloved club. We had stood up to the challenge and had overcome an excellent Manchester City team. More importantly, perhaps, the crowd had supported the team in a way that I thought had almost disappeared. It had been a lovely night. This entry was posted in Season 2011-2012. and tagged 1994-1995, 2011-2012, Atmosphere, Frank Lampard, Manchester City, Nicolas Anelka, Raul Meireles, Songs by Chris Axon. Bookmark the permalink.